Ric Twardowski may have been not-too-thrilled with his 2012 tagged bull being eaten by wolves before he made it back to pack it out (click HERE for his story), but he did actually have one-up on the wolves. 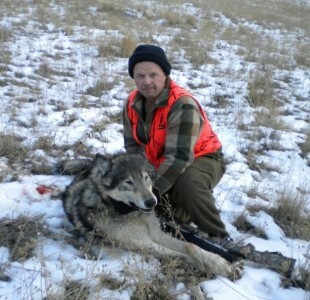 He harvested his first wolf not too long before he shot his bull. Sources say that Ric was out during this year’s 2012 rifle season and, had a wolf walk directly toward him on the path he was walking. His reflexes were fast, but not fast enough to hit it with his first shot before it turned around and ran away. He ended up going after the wolf just enough to get a decent shot and dropped ut. It makes me think of the Marine Corps Sniper saying “You can run, but you’ll just die tired.” Nice shot, Ric!